If you've ever checked the expiration date on milk and wondered if you should gamble on food poisoning you'll love this. Scientists have created a paper-based sensor that can detect when your food and cosmetics have spoiled. The paper is a low-cost and effective way of sensing antioxidents and other indicators of spoiled food and displaying them in an easy-to-read manner. While other technology use solutions that migrate on channels, the team use nanostructures to catch and bind to compounds they're looking for. It's small, fast and efficient. Silvana Andreescu of Clarkson University‘s Department of Chemistry and Biomolecular Science explained how it works. 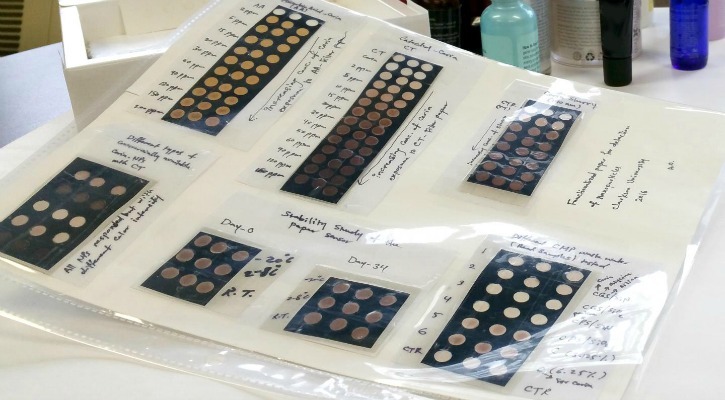 "My lab has built a versatile sensing platform that incorporates all the needed reagents for detection in a piece of paper. At the same time, it is adaptable to different targets, including food contaminants, antioxidants and free radicals that indicate spoilage," she said. "We use stable, inorganic particles that are redox active. When they interact with the substances we want to detect, they change color, and the intensity of the change tells us how concentrated the analyte (the substance being measured) is." Not only can these labels save you from spoiled ranch dressing, but it could have other implications. For example, the labels could be used to authenticate teas and wines by their antioxidant content, search for new medicinal herbs in the Amazon, or eventually detect salmonella and E.coli to prevent food poisoning. It's not just about upset stomachs. The CDC estimates foodborne diseases cause approximately 76 million illnesses, 325,000 hospitalizations, and 5,000 deaths in the United States each year. More than 200 known diseases are transmitted through food. So, anything that can provide a safe and effective way to warn against food poisoning would be a huge boon. Expired cosmetics can also cause problems like skin rashes, irritation and reddening. The researchers are presenting their results today at the 254th National Meeting & Exposition of the American Chemical Society (ACS). ACS is the world's largest scientific society and the meeting features nearly 9,400 presentations on a wide range of science topics. So, the next time you have to check the expiration date, look forward to the day when there'll be a handy little label telling you to throw that bad boy out. What do you think of the labels? What's your worst experience with expired foods? That would be great for me. I can't smell so it's hard to know when exactly some things have gone bad.